If you’ve ever considered getting your MBA, you’ve probably asked yourself the million-dollar question: Is business school worth it? It’s a fair question. After all, one of the first steps in becoming a savvy businessperson is learning how to investigate the cost-benefit analysis of any business decision properly. 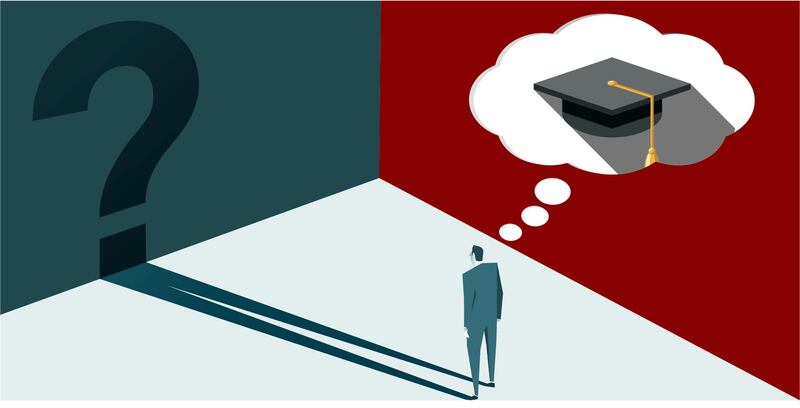 Is the outcome of obtaining your MBA worth what you would have to give up—time, money, etc.? If not, what would the result need to be to make it worth it? To answer these questions, we surveyed 648 MBA grads and 484 potential MBA seekers1 to gather data and come up with an objective answer. And not only that, we’ve decided to give prospective students the opportunity to tell us what they think for a chance to win a full-ride to the Jack Welch Management Institute, a $43,800 value. After analyzing the survey data, it became immediately apparent that money was the primary determining factor in whether or not someone chose to enroll in an MBA program. Of the 484 participants who said they decided not to enroll in an MBA program, 42% of them cited money—the cost of the program—as the primary deterring factor. A little less than 20% of people said that time was another primary reason they chose or would choose not to enroll in an MBA program. Of those who did decide to enroll in an MBA program, 41% of them said they did so, again, because of money—they wanted to earn a raise or increase their salary potential. Among other goals was the desire for personal development and a desire to obtain a promotion or a more senior role. If the primary goal of earning an MBA for people is an increase in salary, followed by obtaining a promotion, then how do participants fare? The numbers indicate that they fare pretty well! 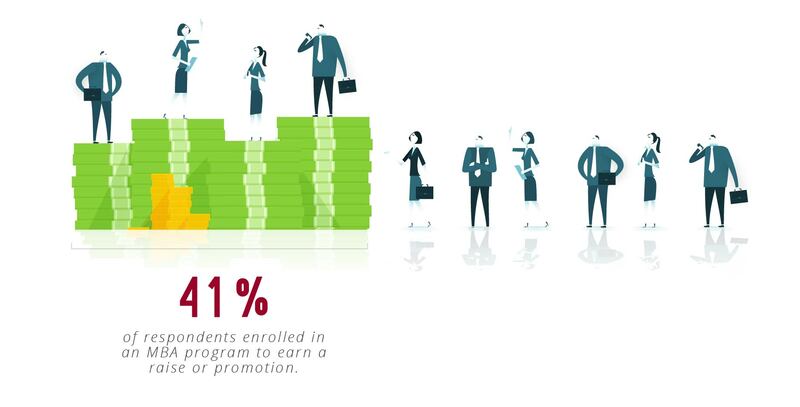 A staggering 77% of MBA grads we surveyed reported an increase in pay, a promotion, or both. And, online students fared better when it comes to advancement, with 84% receiving a raise, a promotion, or both compared to 69% of traditional MBA students who take classes on-ground. For those who consider a salary increase to be the primary reason for enrolling in an MBA program, our survey findings show that an online MBA program may be the way to go. Of the 291 online MBA students in our survey who received a raise, 90% reported at least a 10% increase in salary. Online students fared slightly better than traditional students; 85% of the 177 of traditional respondents reported a raise of 10% or more. According to a LinkedIn survey, the most in-demand soft skills sought by companies are leadership, communication, and collaboration, with leadership being the most critical skill. According to another LinkedIn article, it’s your leadership ability that is most likely to land you a promotion. With this skill so highly sought after in the current job market, it would make sense to evaluate how MBA programs equip students to be leaders when trying to determine whether business school is worth it. According to the MBA graduates surveyed, 45% said the skills their program most likely improved were leadership and management. Of those who said they grew in their leadership ability, 61% grew in decision-making and 41% grew in managing and motivating their team. And 35% of all surveyed MBA grads said they were able to improve presentation skills which are critical to building executive presence. The general aim of any successful business school is to teach students how to develop essential leadership skills—communication, strategic decision-making, the ability to assess and solve problems under pressure, and more. One Lucky Prospective Student Will Earn the Opportunity for a Full-Ride—a $43,800 Value! JWMI asked scholarship applicants to address the following prompt in a 500-word essay. One lucky participant was selected for an opportunity to earn a full-ride (yes, you read that correctly!) scholarship to JWMI. Why are you considering an MBA at this point in your career, and why is an online MBA from the Jack Welch Management Institute the right fit for you? The scholarship application deadline passed (December 14, 2018, at 11:59:59 PM Eastern Time.) JWMI is excited to announce the winner of the scholarship is Leslie Fife! 1. Survey methodology: We surveyed 1,132 Americans from Amazon’s Mechanical Turk, a virtual labor market for online Human Intelligence Tasks (HITs). Thirty-nine percent of our participants identified as female and 61 percent identified as male. Participants ranged in age from 25 to 61. No students or alumni from the Jack Welch Management Institute were included in the survey.